RIT’s 12th annual Creative Industry Day is scheduled for March 30 inside the Gordon Field House. At last year’s event, RIT students pictured here met with representatives from Carrot Creative based in Brooklyn, N.Y.
Rochester Institute of Technology’s 12th annual Creative Industry Day is scheduled for 11 a.m. to 6 p.m. Thursday, March 30, inside the Gordon Field House, providing companies from near and far the opportunity to meet with university talent in a career fair setting. According to organizers, the day’s goal is to offer career-related programming and the opportunity for students to meet professionals from the creative industry, obtain feedback on their portfolios, and make valuable connections that may benefit their careers. A number of the professionals who attend Creative Industry Day include RIT alumni returning to campus to represent their companies or share their experiences and advice to current students. Creative Industry Day features a wide variety of businesses from large global companies such as Google and Hasbro to boutique agencies and digital production houses from around the country. Companies from as near as Rochester and New York City and as far as California and Oregon are scheduled to attend this year. In all, about 70 companies are expected to be here. The event begins with a keynote speech from 11 a.m. to noon by Sean Petterson, founder of the industrial safety products company StrongArm Technologies Inc. Petterson graduated from RIT in 2013 in industrial design. Earlier this year, he was named to the prestigious 2017 Forbes 30 Under 30 list in manufacturing and industry. Attendees will hear from a panel of experts on “How to Succeed in the Creative Industry” from noon to 1 p.m. The panel will feature a discussion and Q&A on the many factors—including a strong portfolio, a useful network of contacts and effective self-promotion—that go into a winning formula for success in the creative fields. 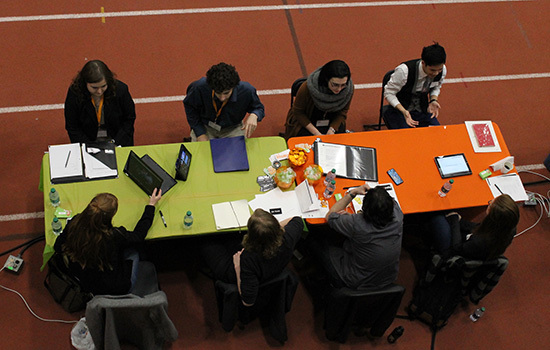 The panel will be followed by portfolio reviews and networking from 1 to 6 p.m. RIT Creative Industry Day is a portfolio-based event geared toward CIAS students and other RIT majors and alumni interested in working in the creative industry. Three companies are scheduled to make pre-event presentations in room 1125 of the Chester F. Carlson Center for Imaging Science (Building 76) the evening before. Hilary Dennis, creative director at Helios Interactive, an experience design studio based in San Francisco, will present from 5 to 5:30 p.m. His talk will be followed by Kyle Beikirch of AKQA, a digital agency also based in San Francisco, from 5:30 to 6 p.m., and Ryan Kiley from Portland, Ore.-based Instrument, an independent digital creative agency, from 6 to 7 p.m.
Students needing an interpreter for the presentations or at Creative Industry Day should go to https://myaccess.rit.edu to request. Students on Twitter and Instagram attending the event are encouraged to use the hashtag #RITCreativity. For more information, including registration and adding work samples to a portfolio site, go to www.rit.edu/creativity or call 585-475-2301. Students should bring their ID for checking in at the event.